This long-sleeved classic women's shirt is made of soft organic cotton flannel in beautiful plaids. Made with 59% organic cotton/35% polyester/6% spandex fabric, Fair Trade Certified™ sewn boxer briefs that provide soft, next-to-skin comfort for daily wear. This low-riding hipster underwear is made of soft, lightweight, moisture-wicking fabric that's and treated with miDori® bioSoft and Polygiene® permanent odor control. Fair Trade Certified™ sewn. 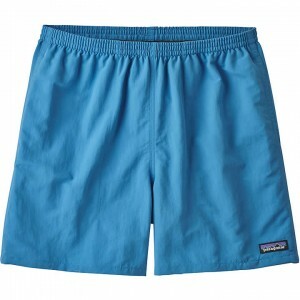 Rugged, multifunctional shorts designed for use in and out of the water, made of quick-drying 100% nylon (92% recycled) with a DWR (durable water repellent) finish. A soft and supple snap-front shirt that's windproof, weather-resistant and insulated with warm 700-fill-power 100% Recycled Down. Patagonia's warmest one-piece bunting is insulated with 600-fill-power 100% Recycled Down (duck and goose down reclaimed from down products). It's lined with soft polyester fabric and has a generous length to help keep extremities protected whether your little one is crawling, standing or sitting. With heritage design lines, a warm fleece jacket made with a modern blend of recycled wool, polyester and nylon fabric that's Fair Trade Certified™ sewn.